The endearing story of young Molly's dream to fly through the air like a real dancer, from her first shaky lessons to her dazzling Christmas recital. 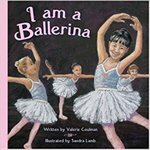 Coulman, Valerie, "I Am a Ballerina" (2004). DIVerse Families. 136.